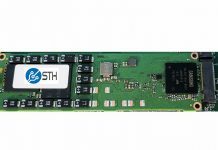 At both OCP Summit 2019 and GTC 2019 we saw a number of 256GB DIMM demos on the show floors. 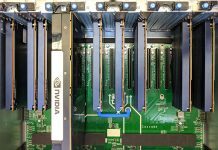 The rationale behind these DIMMs is simple, more RAM in a server means more capacity to run in-memory applications and get higher virtual machine densities, and those are just examples. The memory makers were out showing off their newest high-capacity products at the big server shows. 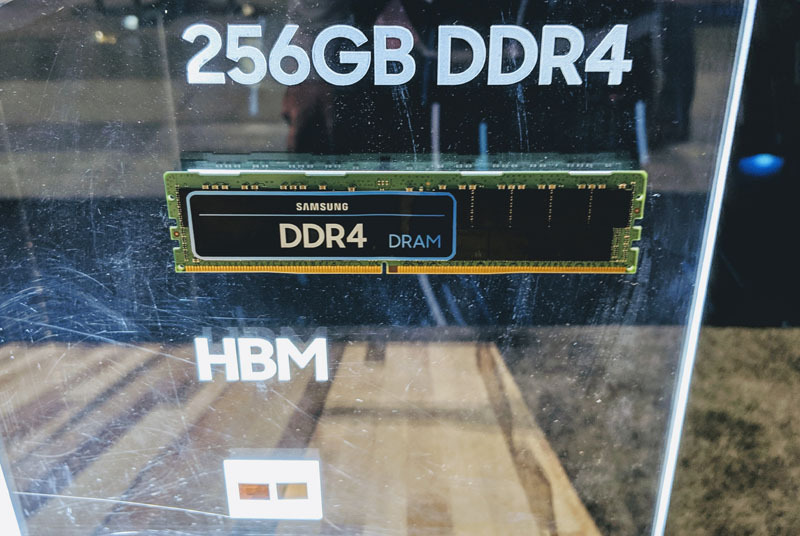 At both shows, Samsung showed off its 256GB DDR4 LRDIMM at both shows on clear acrylic. At OCP Summit 2019, Samsung showed off a dual AMD EPYC 7001 “Naples” generation server running with 4TB of memory using only sixteen LRDIMMs. In the Naples generation of EPYC, this is important because running at 1 DIMM per channel means that the DRAM and Infinity Fabric stay at 2666MHz clock. We explored what happens when these clocks are not maintained in: AMD EPYC Infinity Fabric Latency DDR4 2400 v 2666: A Snapshot. We asked about if one could add 256GBx32 in Naples. The Samsung rep at OCP Summit 2019 told us it was not possible until the next generation. That means AMD EPYC Rome should support 4TB of DRAM per CPU or 8TB of DRAM in a dual socket server. 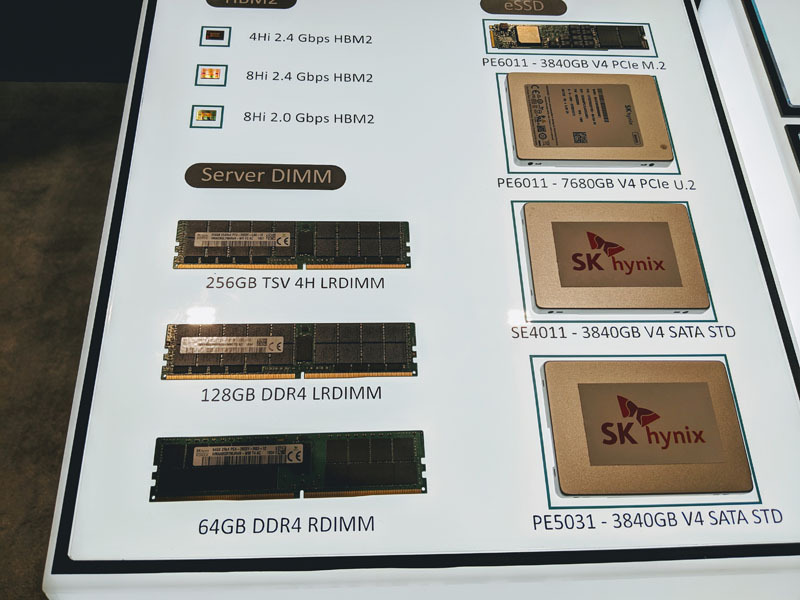 SK.Hynix also showed off its new 256GB DDR4 LRDIMM at NVIDIA GTC 2019. You will notice that both companies have their HBM(2) products on display along with various SSDs. In the lab, we actually use quite a few SK.Hynix M.2 22110 SSDs with PLP. Micron told us they have 256GB LRDIMMs, but we did not see it in their booths. The folks that we spoke to could not direct us to them. Still, it is safe to assume all of the major memory providers are going to have 256GB DIMMs in the near future. That will have a major impact on the server ecosystem both to increase capacity. On the other end of the spectrum, it should drive down prices of lower capacity modules as DRAM density increases. Good that DRAM prices is finally back to 2016 level and likely reach historic low in 2019 assuming the current trends continues. I wonder how much would a 8TB DRAM Dual EPYC Cost. What used to be called Big Data aren’t so big anymore once they fit into DRAM. We could have our Database continue vertical scaling without ever going into the complex world of Distributed DB. Interestingly Crucial no longer sells 128GB 3DS LRDIMMs based on 8Gbit DDR4 and TSV. Very cool. I already noticed that the DDR4 2666 32GB RDIMMs I purchased in Dec 2018 have already dropped from $361 (price I paid per DIMM) to now $273 each in March 2019. Will be cool to see these drop in price further. 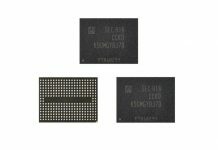 do you have a source for Samsungs 256GB being LRDIMM? It says RDIMM on the Naples Screenshot, the others dont specify.